A smaller iPad is supposedly, probably, maybe coming. The smoke on the rumored 7.85-inch iPad Mini is so thick now that it seems like it's going to be a real thing by Cupertino. But with new rumors of it taking a different shape than the iPad, what would it look like? Maybe like this. Nickolay Lamm of InventHelp updated the renders of the iPad Mini next to the current iPad and adjusted the dimensions to the new reports of the upcoming iPad Mini having a super thin bezel. Remember, these photos just show mockups of rumored specifications that have been floating around—a 7.85-inch display, the new mini-dock port, the thin bezel—but from the rendered looks of it, it definitely looks like something that fits with the rest of the iOS family. Does the smaller size interest you? 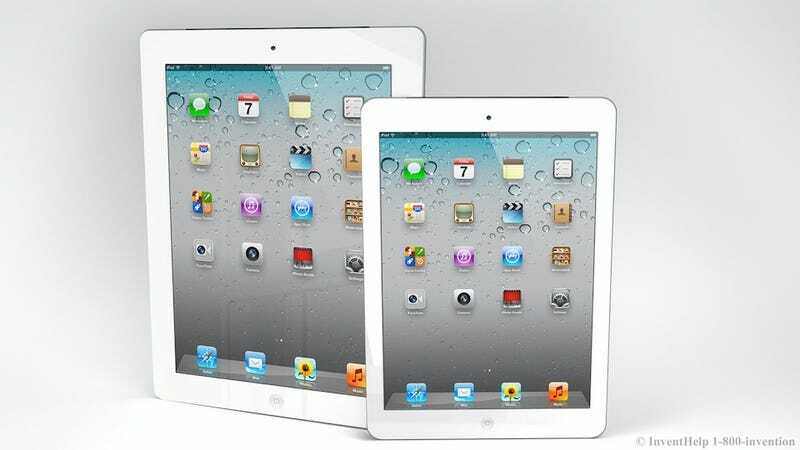 The smaller iPad could be announced on September 12th along with the iPhone 5 or in October.